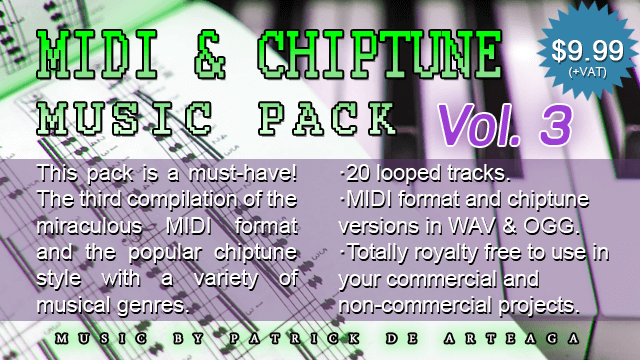 With pride and joy, I want to introduce you to the volume 3 of my MIDI and Chiptune music packs, which contains a meticulous selection of 20 of my free songs in the above-mentioned formats for a low price. Fantastic, emotional, terrifying, mysterious, epic, tense and exotic. Like this is how we could describe this compilation of music to use in your video games or in any of your multimedia projects, whether free or commercial. I have tried to create a variety of musical genres and feelings in this third bundle that can work as a complete soundtrack. And, yes, as always, my products are completely royalty-free; that is, if you market your game or project and it contains music from this pack, you don’t have to worry about paying me percentages of your profits. I know you already know what it means, but, isn’t it true that reading it again makes you feel safer? -No. I don’t even know what the MIDI format is. With MIDI files you can do absolutely anything. Yes, anything. A file of this format can be completely edited at your will using a digital audio editing program that has a sequencer with MIDI multitrack support, as in the case of any Digital Audio Workstation (DAW). You can completely modify my songs to the point of creating your own soundtrack! Also, if you just want to use my songs in a format that helps optimize the size of your game, these files are the perfect solution. For example, the song Heroic Intrusion in MIDI format is only 24.7 KiloBytes. And if the reason you’re interested in this pack is because of its chiptune versions, these volumes are the compilation you are looking for. Here you have 20 songs in 8-bit of different musical styles to add life to your retro project. And if you add the content of the other packs to this, you already have a whole library to create your own vintage video game saga. Remember that you can listen to these songs on the section FREE Music to get an idea of their content. And I remind you that you can use the songs of this pack (and all modifications that you make) in your commercial projects, totally royalty free! If you are not certain and want to test some of this type of files first, you can do it with MIDI & Chiptune Music Pack Vol. 1, it is completely free if you subscribe to my newsletter. Don’t wait for its price to rise over time! MIDI and Chiptune music packages do not leave the buyer exempt from complying with the terms of the Creative Commons Attribution license. If you want a non-attribution permit for these tracks you can purchase a Pro License.